The Tallest Mountain In The Solar System Is Located On? All Comets Have What Common Trait? If you want to see the tallest mountain in the solar system, you’d better pack your bags because you sure aren’t going to see it from the comfort of Earth’s familiar atmosphere. The tallest mountain in the solar system is located in the western hemisphere of Mars and rises an astounding 14 miles above the Martian sea level (if there were still seas to speak of) and 16 miles off the now-dry sea beds. 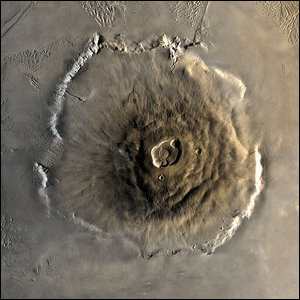 Even without the extra elevation of the dry sea bed factored in, Olympus Mons is still three times as tall as Earth’s Mount Everest and taller than the next tallest mountain on Mars by several miles. Curiously, the second tallest mountain in the solar system isn’t even on a principal planet but located on the enormous minor-planet/asteroid 4 Vesta. 4 Vesta is 326 miles in diameter and sports a mountain, Rheasilvea Mons, that is 14.2 miles high.